Where is Turks and Caicos Islands Located Anyway? Where is Turks and Caicos Located Anyway? Back in January, Colby and I were looking at all of the airline miles we had amassed and decided we needed to take the kids somewhere. After losing my mom in August and finding her bucket list afterward, I wanted to make sure that we lived life a little different. I wanted to live in the moment and not worry so much about doing things later. “Later” doesn’t always come. I used the airline miles calculator to decide where we could fly all eight of us, and to my complete surprise, Turks and Caicos came up. I didn’t even really think twice about it. I told Colby that was where I wanted to go. We picked a date and booked the flights. We didn’t tell the kids until after we called and confirmed all eight tickets and had a way to get there. Now, Colby and I knew all about Turks & Caicos because of an annual blogging conference held there each year. We had been invited to attend a time or two, but because of airfare for just five of us, we simply couldn’t afford to go. Finding the opportunity to take all EIGHT of us for far less than the cost of just one regular airline ticket was like a miracle in itself. We also knew, just from talking to our oldest about her college graduation schedule, that our kids probably didn’t know where the Turks and Caicos islands were. Therefore, when we sat down to tell them that we were going on vacation, we showed them a video of the island. We talked about how it’s repeatedly been voted the Best Beach in the World and how incredibly crystal clear the water is there. That was enough for them to get just as excited about the trip as we were. 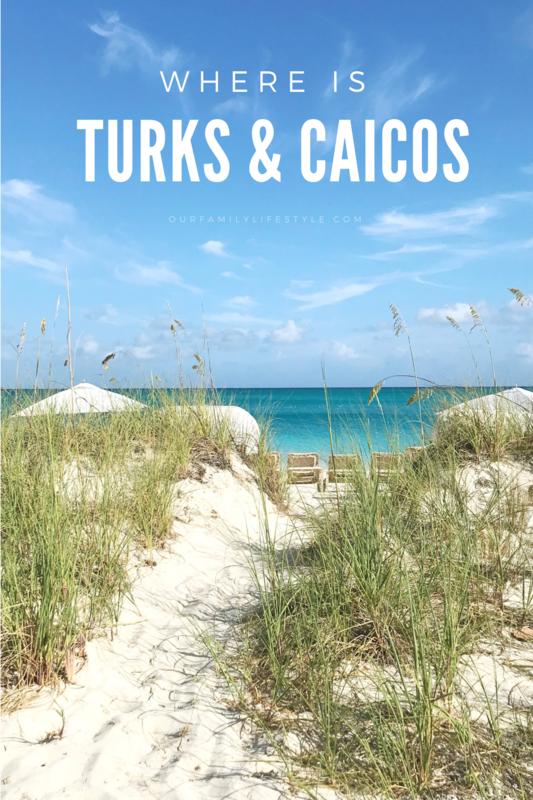 Therefore, before I begin a series of posts to tell you our favorite things about Turks & Caicos, I thought perhaps we should start with where exactly The Turks and Caicos Islands are located. The Turks and Caicos Islands are a British Overseas Territory, located in the Atlantic Ocean and considered to be part of the Lucayan Archipelago along with the Bahamian island chain, adjacent to the north of the Caribbean. With more than 40 small islands and cays, the eight inhabited islands are separated into two island groups; to the east of the Turks Island Passage are the Turks Islands of Grand Turk and Salt Cay and the west are the Caicos Islands South Caicos, Middle Caicos, North Caicos, Providenciales, Pine Cay and Parrot Cay. There are around 100 named islands and cays in the Turks and Caicos. The islands are located 575 miles southeast of Miami, Florida, south of the Bahamas and east of Cuba and the country of Hispaniola (Dominican Republic and Haiti). Because The Turks & Caicos Islands are a British Overseas Territory, United States visitors do need a passport to visit. But, it will be well worth it! The average temperature ranges between 80 and 90° depending on the season and they have, on average, 350 days of sunshine. It’s extremely likely you will have great weather during your stay. (Note: hurricane season runs from June 1 to November 30 each year). English is the official language and the US dollar is the official currency of Turks and Caicos. This all makes it very easy to travel to the islands! So, when are you planning to visit Turks and Caicos?